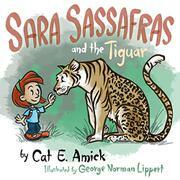 Sara Sassafras and a variety of zoo animals star in Amick’s debut board book, which aims to help raise funds for Pennsylvania’s Erie Zoo. After visiting the zoo with her parents, where she saw many different creatures, young Sara has a dream about meeting a tiger. He changes first to a cheetah, then a leopard, and finally a jaguar; he thanks her for showing him that he can “be a cat of all different stripes.” Sara, when she awakes, calls her new friend a “tiguar,” a blend of a tiger and a jaguar. She understands that he exists only in her thoughts but that she can summon him when she plays with stuffed animals. The fairly standard story appeals to very young readers’ love of animals and to the importance of imagination. The text occasionally rhymes, but it’s not in strict poetic form; however, it does maintain a rhythmic cadence that youngsters will enjoy. Although the story is about animals and inventiveness, adults can easily interpolate ideas about openness to change. Lippert’s colorful ink-and-watercolor illustrations are charming; some feature the heavy use of turquoise and orange-ish reds (Sara and her parents all have reddish hair), lending them the feel of kids’ books of decades past. A pleasant, if not groundbreaking, addition to the animalcentric children’s book canon.